Yep. 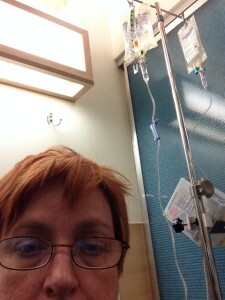 It was chemo day. First time, and I feel pretty good so far. Tired, but not bad. Still working on the many replies to all the supportive comments and emails… you guys are great. I’ll post a note when I’ve replied to all. In other news: Amazon still has not got back to me about allowing the early purchasers to get a corrected version of The Steerswoman, without that peculiar issue where “replace” was replaced with “With”. It’s only 25 occurrences in the entire book, but I tried to stress to Amazon that my readers needed the real version! They say they are reviewing the issue. Well, it’s the holidays and real people at Amazon have to make the decision, so it might be a bit. If we get no action, I’ll consider alternate ways to make this right. Hey, know what I did during chemo? I wrote.